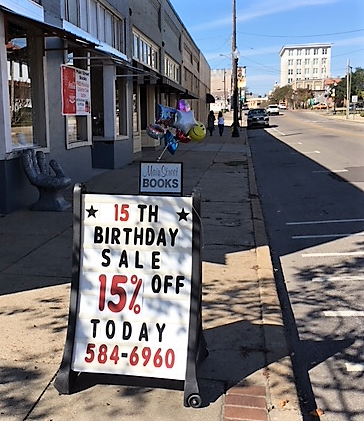 A whole lot of celebration is happening at Hattiesburg’s Main Street Book Store. First came the fifteenth anniversary, accompanied by a sale, of course. In that fifteen years, Jerry and Diane Shepherd have added a special spot in Hattiesburg, MS as part of the successful effort to make downtown a happening place. I’ve had my own observations and experiences in this fifteen years. Though I’m not a big-name author, Diane included me in a group signing and held a luncheon to promote my contributions to Cup of Comfort anthologies. When I began my search for the Ezra Jack Keats books that I did not own, I took the list to Jerry and told him I didn’t want to pay collector’s prices but wanted good copies of each, some out of print. He called when he had located all of them – at reasonable prices. We both got a surprise when I opened them to inspect and found one of them autographed! They know my name when I show up and allow me to meander through their books, pottery, and Mississippiana to my heart’s content, and commiserate with me on the months when the biggest charge on my credit card is to Main Street Books. They know what is on their shelves and how quickly they can get anything that is not. They once even gave me an ARC (advance reading copy) of a book I asked to order so I didn’t have to make a purchase. Try any of the above in a big box store and see how far you get. This year Main Street Books celebrates Mississippi’s bicentennial by special emphasis on the state’s authors, giving a Mississippi bicentennial Coke with each purchase of a book by a Mississippi writer. On this very day December 4, they have their 14th annual celebration of an author extravaganza with more than twenty authors present to sign books from 4 to 7 PM. Like the good Hattiesburg neighbors they are, they recommend in their event advertising that you step across the street afterwards to enjoy dinner at Grateful Soul from 4 until 8 PM. Lest you think Main Street is alone, other local book stores in towns far away from me have gotten autographs on books from my author friends and shipped them out to me with pleasure. I “borrowed” the sign in this last photo from an independent book store Facebook friend that gives additional reasons for shopping locally. I hope recent statistics that say these independents are making a comeback are correct. I also hope that Main Street Books will stay in business until I make that big-name author status – which means for a very long time!